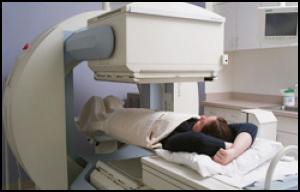 Radioisotopic renography (renal scan) involves the use of radioactive materials to examine the kidneys. The two most common radiolabelled pharmaceutical agents used are Tc99m-MAG3 (mercaptoacetyltriglycine or mertiatide) and Tc99m - DTPA (diethylenetriaminepentacetate). In the DTPA renal scan, there is the use of radioactive material (radionulides) to examine the person’s kidneys and evaluate their function. This examination of kidney function comes under nuclear medicine in this process, there is use of radionuclides and relies on the process of radioactive decay in the diagnosis of disease. It is used in 1960’s at Nephro – Urology. A renal scan is also known as a renal imaging, or a renogram or renal scintigraphy. The Radioisotopic renography ie. The DTPA renal scan is performed asses the blood supply, function and excretion of urine from the kidneys. This test can also find out the percentage of each kidney contributes to the total kidney function. Renal tubular function and perfusion. Renovascular hypertension (high blood pressure in the arteries of the kidneys). Renal artery stenosis (narrowing of the arteries that take blood to the kidneys). Renal tubular blockage and damage. The patient is given an intravenous injection of a radioactive material called radioisotopes. This radioisotope releases gamma rays. The gamma scanner detects the gamma rays. The gamma camera scans the kidney area. It tracks the radioisotope and measures how the kidneys working. The camera also works with a computer to create images. These images detail the structure and functioning of the kidneys based on how they interact with the radioisotope. Renal scan images show both structural and functional abnormalities. This helps doctors to diagnose a kidney problem in its earlier stages. There are no side effects from the radioactive injection. A diuretic is given to an increased flow of urine, if required. A Person may feel thirsty and need to drink plenty of fluids. Kidney stones are the most common kidney problem. When minerals and other substances in the blood crystallize in the kidneys, forming solid stones. An inflammation of the glomeruli occurs, that condition is called Glomerulonephritis. Glomeruli are very small structures inside the kidneys that filter the blood. Glomerulonephritis can be caused by infections, drugs, or congenital abnormalities. It is a genetic disorder that causes numerous cysts to grow in the kidneys. These cysts can interfere with kidney function and cause kidney failure. Polycystic kidney disease is a serious condition. Urinary tract infections (UTIs) are bacterial infections of any part of the urinary system. They are easily treatable and rarely lead to more health problems. Chronic Kidney Disease is a the most common form of kidney disease. It is commonly caused by high blood pressure. Long-term condition that does not improve over time. Renovascular Hypertension is also called ‘Renal Hypertension’. It is a condition in which High blood pressure (greater than 140/80 mmHg) caused by narrowing of the arteries that carry blood to the kidneys. Narrowing or blockage of the arteries that supply blood to the kidneys is called ‘Renal artery stenosis. Patient’s kidney size and shape influence the results of your DTPA scan. An abnormal kidney structure could result in an incorrect reading. The Patient's diet is also important as much as taking medications. Healthy lifestyle may help to prevent many causes of kidney disease. Control Diabetes by taking Insulin. Cut off high cholesterol diet. Take a low salt diet. Take healthy diet includes fresh fruits, veggies, whole grains, and low-fat dairy products. Increase physical exercise and try to weight loss. In Ayurveda, there are a large number of medicines which help to treat the known cause of kidney failure. There are some herbs which are helpful to treat Renovascular Hypertension. Herbal preparations REVIVE KIDNEY PACK which is highly effective to fight with all Kidney disease. These products are 100% vegetarian and natural. It maintains Tridosha, the three energies of the body (pitta, kapha and vata dosha). 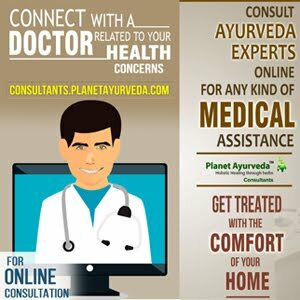 This pack is formulated by MD Planet Ayurveda doctors. All herbs a have well defined explation in Ayurvedic culture. It is an herbal powder which is very helpful in maintaining healthy kidneys. This Churna is made by different herbs : Punarnava (Boerrhavea diffusa), Varun (Crataeva narvala), Gokshur (Tribulus terstris), Kasni (Chichorium intybus). This is especially suited for people to maintain a healthy urinary system. Dosage: 1 Teaspoonful twice daily with water . Boil 1 Teaspoonful in 400ml water until it remains 50-60ml. Filter the preparation with a regular tea strainer and drink. 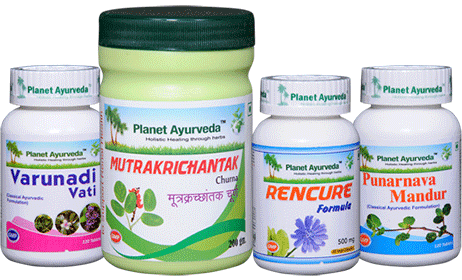 It is very good herbal combination that is given as an addition to mutrakrichantak churna along with other health supplements for supporting kidney health. It is a natural supplement that helps maintain a healthy urinary system in a natural way. Dosage: 2 Capsules, twice daily with plain water after meals. It is a classical Ayurvedic formulation with the same name, which is being used since ancient times for the maintenance of a healthy urinary system and a healthy kidney function. Punarnava, which literally means 'bring back to life' or 're-newer'. It has multiple benefits to cure disease. Its leaves are used as vegetable. It helps to remove excess of water from the body in case of kidney failure. The herb is regarded as the natural cleanser that helps to remove toxins from the kidney and maintain healthy kidney.